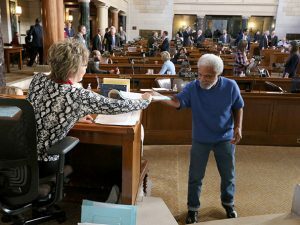 Sen. Ernie Chambers submits a new bill. LB844, introduced by Bellevue Sen. Sue Crawford, which would adopt the Safe Families and Workplaces Act. A complete list of bills introduced thus far is available at NebraskaLegislature.gov.